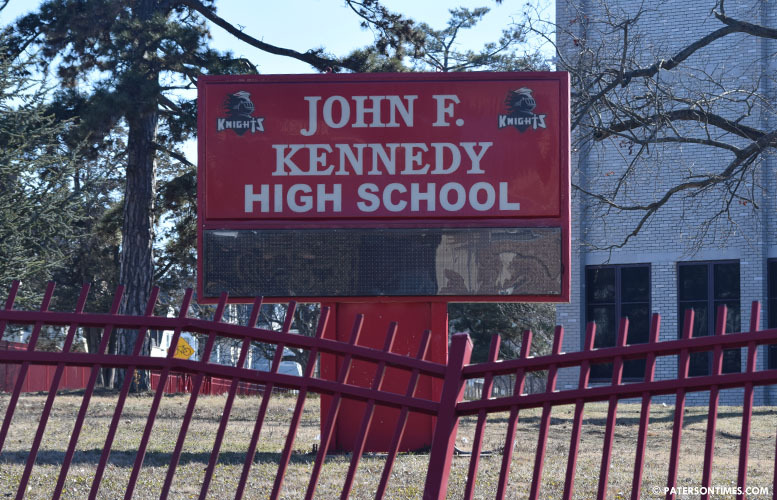 Half-dozen students suffered minor injuries on Thursday morning after a pair lit fire cracker inside a classroom at John F. Kennedy High School. School nurse checked all six students. Two suffered second-degree burns. One was burned, but not as severely as others. And three had ringing in their ears, according to school officials. Paul Brubaker, spokesman for the Paterson Public Schools, said the school immediately notified the students’ parents. He said none of them had to be taken to the hospital. The incident took place inside a second-floor classroom of the School of Architecture and Construction Trades (ACT) at John F. Kennedy High School at about 10:45 a.m. The spokesman said students from the second floor were evacuated to the auditorium. School security investigated a “possible firecracker or smoke bomb” released into the classroom. Police were called to the scene. Police chief Troy Oswald said two students, a boy and girl, were arrested. Both are 16 years old, he said. The girl brought the firecrackers into the school building and the boy lit them in the classroom, according to police. It wasn’t immediately clear what offense each student was charged with. Brubaker said both students were placed on 10-day out-of-school suspension following the incident. School officials allowed students to return to the second floor after 12 p.m.
How about inciting a public panic, and public hoax, assault, assault with a deadly weapon, firecrackers can take off fingers and toes and cause deafness…which by the ringing of the ears reported is no little firecracker, rather and M-80 or bigger-very dangerous. . Only a 10 day suspension? Any other district they would get expelled or alternative placement. I guess you forgot certain fireworks are legal, and why the security flaw ? They could've dismissed fire alarm as there was no fire, and why the hell an active shooter ? If they knew it was a firework ? Why assault with a deadly weapon if it wasn't intentional to hurt someone nor was it deadly. If that was cause all fireworks would be illegal. Im sure lit inside a class room everyone knew it was a firework. And any sound is amplified indoors so does not have to be an M-80 or bigger. "If this was an M-80 or bigger indoors I'm sure there would' ve been permanent hearing loss instantly, as well as bleeding from the ears. Law enforcements use flash bangs which have same results like ear ringing – Temorary blindness. Suspension is enough. Sounds like your the only one with a flaw. " EVERYBODY RUN FOR YOUR LIFE !" says MarquinhoGaucho. Fireworks are illegal in NJ. I am sure there was a lot of smoke and big firecrackers can take of small limbs and if exploded by your head can kill you.